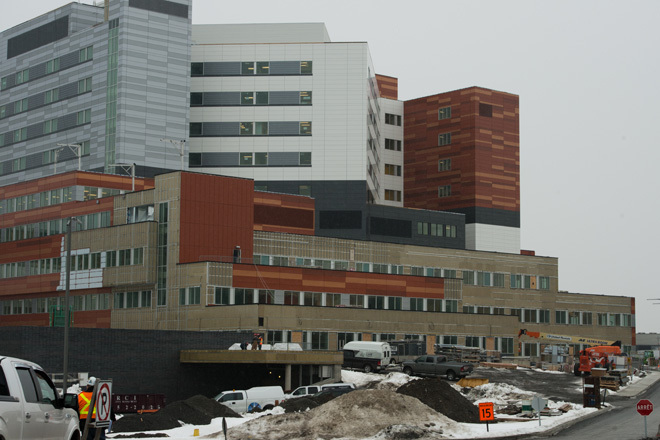 The community plays a crucial role in the McGill University Health Centre. We trace our roots to individuals who wanted to ensure that care and services were provided for their fellow citizens. Their interest and that of succeeding generations has provided the vibrancy that is essential to an evolving institution. Community involvement takes many forms. We are indebted to the people who volunteer at the hospitals, to patients who advise on committees, and to our board members, whose engagement earned the MUHC special mention from accreditors in 2013. We value the expertise of the individuals and groups to whom we have turned for input on programs and design. We are especially appreciative of the fundraisers and donors whose generosity and support have helped us to build buildings, acquire equipment and develop new patient care programs. Our challenge today goes beyond preserving the attachments to the MUHC hospitals built up over more than a century; we also need to expand the possibilities for participation and incorporate community ideas and energy into healthcare activities at every level. As you read through this report, it is clear that volunteerism serves to strengthen both health care and communities. We need to keep building bridges between all who contribute to the goal of excellent care. 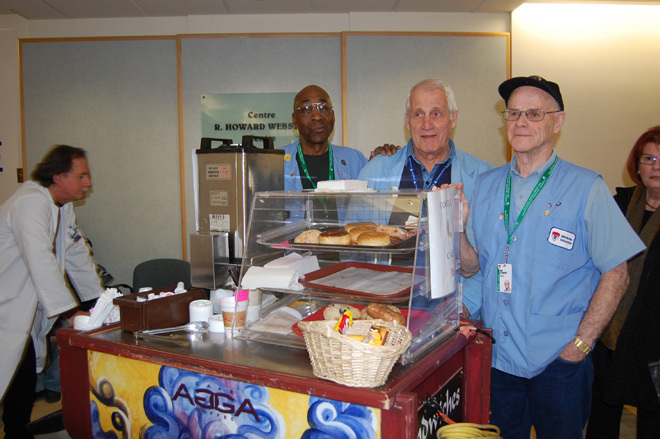 Community volunteers provide the energy and resources required to sustain excellence in our hospitals. Their activities both reflect and build community support, cultivating a sense of pride, responsibility and ownership toward public institutions. As the McGill University Health Centre (MUHC) prepares to move many of its operations to new sites, it is working to bring along the communities that were strongly attached to old sites, and expand and strengthen support for the New MUHC. There is work to be done in harmonizing practices and coordinating priorities, in joining forces and in opening up to new participants. The particular challenges at the MUHC may be situation-specific, but they are occurring in the context of important trends in volunteerism, philanthropy and governance that will affect how community engagement is cultivated, what forms it takes and what impact it has on our institutions and society. In 2013, the MUHC’s Institute for Strategic Analysis and Innovation (ISAI) created opportunities to explore various manifestations of community engagement in order to contribute to a common vision that will help each group focus its efforts toward the future. Community engagement takes many forms, and the ISAI’s exploration examined each of these — volunteers, donors and the advisors who contribute their leadership to committees and boards that help the hospital meet community needs effectively. The ISAI also sought to trace the links between these different activities to better understand how community engagement is and can be nurtured. Ms. Vyncke’s findings reflect themes highlighted in earlier research undertaken on volunteers in the health sector by Professor Femida Handy, formerly at York University in Ontario and now at the School of Social Policy & Practice at the University of Pennsylvania and editor of the Nonprofit and Voluntary Sector Quarterly. While at York, she conducted some of the only studies specifically focused on hospital volunteers in Canada. In a paper published by the Canadian Centre for Philanthropy and Volunteer Canada, Prof. Handy conducted interviews with staff and volunteers at 31 hospitals in and around Toronto. She found the profile of hospital volunteers in Ontario hospitals to be female (74% women) and older (57% over age 54), and noted a decrease over time in the number of long-term volunteers. She also found that students are increasingly likely to volunteer, largely in response to academic expectations, but that their time commitments were shorter than those of the older group. A survey conducted for the Institut de la statistique du Québec in 2010 found that while 91% of volunteers in healthcare organizations were motivated by the desire to make a contribution to their community (similar to other volunteers), 70% also stated being personally affected by the cause. Volunteer management in hospitals has become increasingly professional and new practices are being explored in different centres across Canada. At the MUHC, practices vary between sites and efforts are now underway to harmonize certain procedures. Three managers or staff of MUHC volunteer departments are now undertaking a McGill Leadership Certificate program with the Department of Continuing Education, within which they are looking at models for improving practice. The literature describes a general malaise in hospital Auxiliaries, which now coexist alongside professionally run volunteer programs and professionally led foundations. Hospital mergers and public-private partnerships that accord retail space to private partners also appear as a threat to hospital Auxiliaries: in Prof. Handy’s Toronto survey, 24% of hospitals had recently dissolved their Auxiliaries. Foundations, too, are adapting to new realities. In a 2012 special edition, Ketchum Canada Inc’s (KCI) Philanthropic Trends Quarterly notes that donor goals have changed and sees a shift from “giving to an institution” in the 1990s (and before), to “giving to a project of an institution” in the 2000s, to “achieving impact” today. “What donors want to know is that you are making a difference in the way you said you would,” writes Ms. Marnie Spears, President and CEO of KCI. Major donors today want to be engaged in the organization. The MUHC-ISAI held a half-day conference in September 2013 to explore some of these changes, hear about how they are perceived by different actors, and better understand how to move forward. More than 2,000 volunteers dedicate their time on the six MUHC sites to support the organization in its aim to offer the best care for life. There are four staffed positions to direct and coordinate volunteer services. Ms. Ann Hébert, Volunteer Manager at the MUHC Montreal Children’s Hospital (MCH), participated in a panel on volunteers at the ISAI conference. She confirmed that many of the general trends mentioned above are also at play within the MUHC, specifically the rising proportion of students in the ranks of volunteers. This change is having a significant impact on the volunteer programs within the hospital. Four key points arose from discussion at the ISAI event. “About 60% of the volunteers at the MCH are students,” Ms. Hébert reported. Her colleagues at the Montreal General (MGH) and Royal Victoria Hospital (RVH) adult sites confirm also seeing an increase in the proportion of students within their volunteer corps. Ms. Hébert attributes the MUHC’s appeal partly to its proximity to universities and CEGEPS in downtown Montreal. Students are generally short-term volunteers and require more extensive training and mentoring, especially in the social skills required to make a patient comfortable and offer help. “It can be very challenging to walk into someone’s room and instantly do the correct thing,” says Ms. Hébert. However, all the volunteer coordinators consider the extra effort required for student volunteers to be worthwhile. “It’s part of our mandate to provide education and equip youth with the required tools,” says Ms. Hébert. “Volunteering is a good framework in which to seek knowledge, skills and autonomy as a young person. It’s fun to see them grow into the role.” Ms. Rita Giuliane, Volunteer Manager at the MUHC MGH, is experimenting with peer mentoring, encouraging student volunteers to text their more experienced counterparts for advice. She considers the evolution from newcomer to mentor a valuable part of the students’ development. 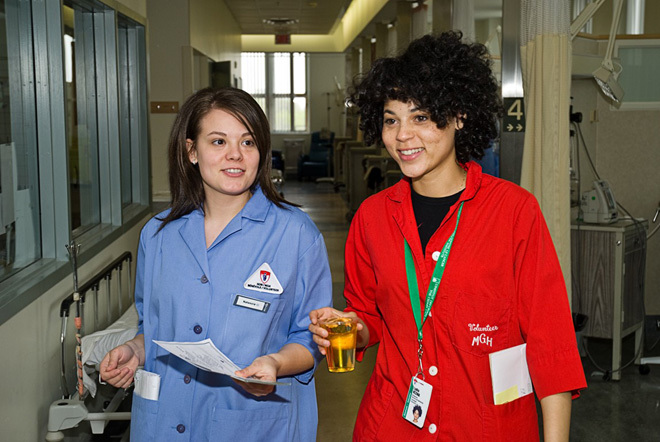 Seasoned volunteers may also have a role in training and supporting student volunteers; as familiar faces on the ward, staff may entrust them to ensure that students’ approaches to helping patients are appropriate. One of the prime motivations of student volunteers is to include the experience on their CVs when they apply to university. Recruitment is not an issue as there are always more applicants than the coordinators can use at a given time. “Word of mouth is the most powerful recruitment method,” according to Ms. Hébert. “Some of our volunteers have had family members hospitalized at our sites; some are former patients at the Children’s and come back when they’re young adults because they want to contribute.” However, the vast majority are students with no particular connection to the hospital other than an attraction to the health sciences. Incorporating students is made easier by creating fixed-term programs. Ms. Nevine Fateen, Volunteer Manager at the MUHC RVH, the Montreal Neurological Institute and Hospital, and the Montreal Chest Institute, runs STEP (Student Training and Education Program) with funding from Pfizer, which recruits high school and CEGEP volunteers to devote 50 hours through the summer months. Mr. Jonathan Mirarchi was a STEP volunteer in the summer of 2013 and described the experience at the ISAI conference. “I spent half my time in the dialysis room with patients, entertaining and helping out. The other half was spent going around the hospital offering movies and books to long-term patients and providing a source of entertainment,” he said. Part of STEP’s rationale is to expose young people to health sciences professions and inspire them to continue with their studies. Different professionals provide lectures on what they do and how they got there. The STEP funding from Pfizer covers a half-time coordinator who helps to select, interview and train the students, as well as prepare unit personnel to incorporate defined student-volunteer programs on their units. At the MUHC MGH, Ms. Giuliane works with the Université de Montréal Faculty of Medicine to provide a for-credit volunteer experience that enables medical students to understand the patient perspective. They are deliberately kept away from any medical interventions and focus on making the patient’s hospital experience better. The program assures a consistent number of student volunteers per term, though it also creates a surge in workload to process and train the group all at once. The university assumes responsibility for student selection. In the surveys she conducted, Prof. Handy noticed a particular sensitivity to the risk of volunteer roles overlapping those of paid unionized staff. For that reason, CEOs were careful not to describe the volunteer role as “essential” or to express the feeling that the hospital could not run well without them. However, that did not appear to be an issue at the MUHC, especially with the nurses, who are closest to the volunteer contribution on the wards. The secret to avoiding tensions between volunteers and staff is to clearly define what volunteers do, which seems to be amply spelled out and respected at the MUHC. “I asked nurses what could be done to improve the use of the time provided by volunteers. Among the responses was to increase communication and coordination, possibly even including volunteer visits in our care plans. In the morning, when the nurse plans the day, it’s important for her to know that a volunteer will be arriving between 11 and 12, so she can then complete her own patient care in the morning to ensure that the patient is present when the volunteer arrives and can thoroughly benefit from this time. When the volunteer arrives in the unit, he or she will not have to wait half an hour until the patient is available. It sounds trivial, but this is important information that should be incorporated into the organization of the day. Preparing staff, especially nurses, to use volunteers takes a significant amount of the volunteer manager’s time. Ms. Fateen at the RVH finds it helpful to have particular programs or offerings so that nursing staff and volunteers come to know what to expect. At the conference, Ms. Hébert described the challenge of quickly matching a family’s request for a volunteer with an appropriate candidate. She also emphasized the need to ensure that a new volunteer was well trained, especially in basics such as confidentiality, safety and hand washing, before going onto the ward. Each of the volunteer managers face particular challenges in ensuring the recruitment, training and effective use of volunteers at their respective sites. They described a common challenge in meeting the needs of both prospective volunteers and of patients. The managers are, in effect, the bridge between the institution and community members who would like to donate their time to improving the experience in hospital. Mr. Alex Paterson may not be a typical volunteer, having been Chair of the Board of Directors and first Chair of the Best Care for Life Campaign. When he decided, after an experience as a patient in the hospital, to devote some of his time to volunteering within the hospital rather than on its governance, it took a little exploration to find the role that best matched his interests with hospital needs. His doorman position enables him to see areas that could use improvement. These are often details that have a considerable impact on people entering the hospital: having to find their way through the hallways just to get a hospital card made rather than having that office at the front entrance; accessing a wheelchair at the entrance; locating a friend or family member who was just brought into the emergency room or intensive care unit; finding a newspaper at night. As a volunteer, his attention is on the patient and on making their experience better and he, like other volunteers, gathers valuable information about problems and can see relatively easy ways to improve them. He also gains an understanding of how ill-equipped some patients are to negotiate the hospital. “You’d be surprised how many people arrive without knowing the name of their doctor or clinic,” he says. “Volunteers see every kind of problem in hospitals,” said Mr. Paterson. “Good responsive ears are needed within institutions to take advantage of this knowledge.” He considers quality committees as a step forward in this direction. Auxiliary volunteers operate independently from the Volunteer Departments and the Foundations, with a mission that overlaps and activities that dovetail those of these other groups. At the ISAI conference, Ms. Sue Britton, Chair of the RVH Auxiliary, stated that Auxiliary volunteers are motivated by a strong sense of belonging to the institution and by the social side of volunteering. Many are nurses who trained and made their careers at the MUHC hospitals, or family members of hospital personnel. 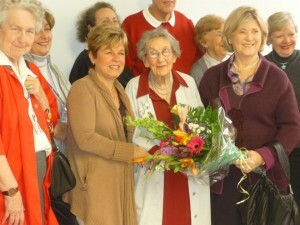 The Auxiliary’s priority is to improve the quality of patient care by raising funds and providing volunteer services. “The RVH Auxiliary raises funds in a variety of ways,” Ms. Britton told the conference. “We have family endowments and investments that bring in returns, retail space with the hair salon, Jean Coutu Pharmacy and Café Vienne, as well as proceeds from the vending machines. We also have a mobile book cart, treasure sales, and hold community events such as the charity ball and golf tournament, a Christmas basket with our raffle ticket sales, brunches, luncheons, auctions and bake sales.” Auxiliary volunteers are a constant presence within the hospital, bringing a coffee cart around to outpatient departments and participating in way-finding and greeting activities. Decisions about how to spend the money volunteers raise are made with the clinical units and often respond to clinician requests for help in acquiring new pieces of equipment. As a member of the Auxiliary, Ms. Britton sits on the Board of the RVH Foundation. Auxiliary members are important community builders and create opportunities for the wider community to be involved in fundraising efforts that also raise awareness about the work of the hospital. A “Toonie Challenge,” organized for the first time by the Friends of the MUHC in 2013, engaged primary and secondary students (along with their parents) in a fundraising initiative that also served to increase community knowledge about the MUHC and build a sense of community ownership around the new hospital site. An event was held across from the new building site and provided many a first glimpse into what “their” new hospital would look like. Auxiliaries also provide continuity of involvement in the hospital for former employees, giving them an opportunity to put their intimate knowledge of the hospital and its routines to good use, even while providing members a chance to spend productive time with former colleagues. 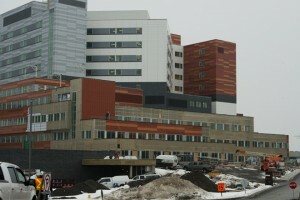 While the move to the new site presents considerable challenges to the Auxiliaries, in terms of retaining their revenue streams and members, becoming as familiar with the new site as they were with the old, and building new networks with new participants, the ambassador role they play bridging hospital and community will be especially important in the period around the move. Charitable donations were responsible for the creation of all of Montreal’s healthcare institutions and remain vital to their operation in the era of public hospital care. At the ISAI conference, Ms. Catherine Rowe, Executive Vice President at the Saint-Justine University Hospital Centre Foundation and formerly Executive Vice President, Development, at the MUHC Montreal Neurological Institute and Hospital, recalled the million dollar gift from Donald Smith and George Steven that built the RVH in the 1880s; the Rockefeller Foundation donation recruited by Dr. Wilder Penfield to establish the Neurological Institute; the contribution from Lacosse Beaubien and the French-speaking bourgeoisie to construct Sainte-Justine as the city’s first French-language children’s hospital; and the donation of individual bricks from families all over the city at the height of the Great Depression to build the Jewish General Hospital in 1934. Today, one can be forgiven for wondering whether fundraising speaks to a breakdown in government responsibility, a question raised by the ISAI’s Special Advisor, Mr. Bernard Lord, who chaired a panel on fundraising at the ISAI conference. Within hospitals, foundations play a leading role in soliciting and managing donations. They are separate entities with separate boards, but work in concert with hospital administration and staff. The foundations are responsible for developing a portfolio of opportunities that clearly expresses hospital priorities determined by the hospital administration in consultation with its senior staff. Mr. Busilacchi believes that ultimately, it is the competent and dedicated people working in the hospital who give the organization its credibility and are the true ambassadors within the community. Their support must be demonstrable, whether in time, money or energy, to bring community donors on board. Communication is essential to mobilize not only the community but also in-house personnel. The foundation’s job is to convince hundreds of people, each one individually, why a project is important and to follow up not just to thank donors but also to ensure that their contribution is recognized, within and outside the hospital. “When major donors have a very precise idea of where they want to put their funds, it is essential to ensure that the project figures among the main priorities of the organization,” Mr. Busilacchi emphasized. Ms. Rowe agrees: “Very clear mission-driven statements from the hospital about why money is needed help light up someone’s motivation to contribute to improvements.” They also help align major donor priorities with those of the hospital. Part of that involves getting the institution involved in community initiatives beyond its own mission. “A hospital is an important enterprise, which also has a role to play in meeting community needs,” says Mr. Busilacchi. Causes such as Centraide and disaster relief after the explosion in Lac Mégantic or the earthquake in Haiti can mobilize people within the hospital to care not only about their own mission, but also about the needs of society.” He recognizes it is not always easy to convince hospital management to prioritize causes beyond the hospital Foundation, but sees tremendous benefit in associating the hospital with challenges in the broader community. It is most often a healthcare professional who creates the initial link between an individual and the hospital, and presents opportunities for people to act on their desire to give something back to the institution. For the past five years, the Aziz family and other families have organized annual fundraisers and have raised significant sums for the NICU to use to acquire needed equipment. The Tiny Survivors event also raises community awareness about premature babies and the people who care for them. The RVH Foundation played a supportive role to their efforts, which was instrumental in encouraging the families to hold a second (and third and fourth) event. Ms. Aziz would now, after year five, like to turn the organizing over to other families, a transition she is looking to the Foundation to assist. The experience of patients is considered a vital contributor to efforts at improving the way care is delivered. And there are an increasing number of opportunities to benefit from patient input. Québec is the only province to have mandated, 20 years ago, the establishment of user committees in all healthcare institutions. A province-wide network, the RPCU (Regroupement provincial des comités d’usagers), supports the efforts of members, providing the information, training, mediation and tools they need to defend patient rights. The Board of Directors at the MUHC includes two patient representatives and a Central Users’ Committee provides a common space for user representatives from each of the MUHC sites. The ISAI conference heard from Mr. Mario Di Carlo, who co-chairs the Users’ Committee at the Montreal Neurological Institute and Hospital and is an executive member of the Central Users’ Committee of the MUHC. Born during the polio epidemic of the 1950s, Mr. Di Carlo was left with some paralysis and has long experience with the healthcare institution. Mr. Di Carlo appreciates that the MUHC mindset favours meaningful patient involvement. “This is manifest in a number of projects,” he said. “Transforming Care at the Bedside (TCAB) is an ongoing project that empowers patients and [healthcare provider] teams to work together to transform and improve patient care. 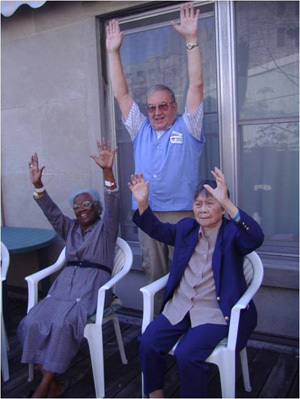 In the PAIN FREE Program, a patient-centered initiative, patients collaborate with staff from the outset to create home management tools for seniors discharged with fractures. Patient representatives have been involved in determining the information needed by these patients to ensure that their pain is managed effectively, validating that the pamphlet content meets health literacy standards in clear and simple language, conducting surveys and patient interviews, and coaching the care team on the patient perspective.” Mr. Di Carlo is also involved with a program called My Tool Box, originally from the US and now pioneering in Québec, which creates tools to empower individuals who suffer from chronic conditions to become self-managers of their conditions, partner with their health professionals and live fuller healthier lives. “It gets patients engaged in their health,” stated Mr. Di Carlo. Other Users’ Committee leaders Mr. Di Carlo encounters in the RPCU are very interested in MUHC projects. And he feels that the MUHC is ready to take patient engagement even one step further. “Going from engagement, where the institution tries to involve users in improvement, to the meaningful use of ‘incorporation,’ where the institution incorporates patients into every decision and policy it makes, is the next logical step. TCAB is a good example of that.” He stressed the difference between being informed about a decision and being involved in making that decision, and is confident that progress towards the latter model will continue. “I see a willingness to create change and involve patient representatives at all levels at the MUHC.” Just recently, the Users’ Committee succeeded in ensuring participation of patient representatives on each of the “grands projets d’optimisation” (GPOs) focused on improving the effectiveness and efficiency of health service delivery. “That proposal was embraced by the Board of Directors,” reported Mr. Di Carlo. Mr. Di Carlo believes the most important motivating factor is confidence they will make a difference. “In order to get patients to commit the time, they have to believe change can and will occur in institutions,” he insisted. “The MUHC has a healthy Users’ Committee environment and there is a perception that change is happening. It helps that management comes to our user groups to discuss developments at the hospital.” The qualitative differences are important: as Mr. Paterson stated, changes to governance structures can be mandated, as happened with patient representation, but laws are not enough on their own to effect meaningful transformation. A truly receptive environment is required to attract truly engaged patients. A patient volunteer coordinator at the MCH who was present at the conference stressed the important role played by nurses and physicians. These professionals are uniquely placed to mention to patients that they would make great patient representatives and direct them toward the opportunities that exist. “For that to happen, the whole hospital from top down has to be on board with the philosophy of patient engagement,” said the audience member. It was during a follow-up visit a year later that a nurse at the Oncology Day Centre suggested that Ms. Nacos join the Patients’ Committee at the RVH and bring her cancer experience to the table. Her involvement grew ever deeper, first joining the Board of Directors of the Cedars Cancer Fund, then starting Cedars CanSupport, where she remains, 25 years later, as Director. In parallel to this work, Ms. Nacos proceeded to chair the Patients’ Committee at the RVH, which involved sitting on the hospital Board of Directors. Today, she is a member of the MUHC Board of Directors elected by the population and works on two important committees: Quality and Communications. Presentations at the ISAI conference on the various manifestations of community engagement revealed individual confidence in the healthcare institution as a precondition for involvement and engagement. That confidence comes from personal experience with the institution and its personnel, but also from media reports that provide the link between the hospital and the community at large. Ms. Gerri Barrer, former Health Specialist Reporter for CBC TV, discussed the role played by media during a final panel at the ISAI conference. “Any media coverage involving a healthcare institution affects community engagement, either positively or negatively,” she asserted. She cited positive examples such as the H1N1 pandemic, where the MUHC maintained regular and open communication with the media and proved highly reassuring to the community. She pointed to openness and honesty as key to maintaining community confidence. “Spokespeople from healthcare institutions must mitigate the institutional tendency to evade issues by not commenting meaningfully at all,” said Ms. Barrer. “They should comment on what they are able to and focus on what is being done to correct problems. The community feels reassured and engaged, and is confident in going to that institution.” She regards the opening of the new Glen site as an opportunity to promote community engagement and emphasizes the need to provide community access to the new site as early as possible. The ISAI invited Dr. Paul Reed, formerly Director General (Research) and Senior Social Scientist, Statistics Canada, and currently Senior Research Fellow at the Centre on Governance, University of Ottawa, to reflect on volunteering within a broader social context. His keynote address, “Civic engagement: the visible and not so visible consequences of volunteering,” introduced key concepts of contributory behaviours and social embeddedness. “The domain of volunteering and giving and caring for community — being civically engaged for the greater good — is a largely invisible but strategically important part of our society. I like to call it the civic sector, rather than volunteering or charitable giving,” he told the conference. In the mid-1990s, while at Statistics Canada, Dr. Reed initiated the Nonprofit Sector Knowledge Base Project. A number of governments across the country, as they made major reductions in their spending on social programs, suggested that the impact of those cuts might be offset if some of the human services previously available through government programs could be provided by organizations in the voluntary and charitable sector. Reliable information about the actual ability of the sector’s organizations and volunteers to accept a significant increase in their workload was lacking. In response, a multi-year initiative to build a corpus of empirical knowledge about the voluntary sector and the contributory behaviour of Canadians was initiated. Dr. Reed and colleagues produced some 50 papers on the subject, which represent the bulk of what is known about volunteerism in Canada today. Note that this work did not focus on the healthcare sector particularly. “What we have learned from our 15 years of research,” Dr. Reed told the conference, “is that volunteering rates are stagnant and the character of volunteering is changing. Long-term committed volunteering is shrinking, and episodic short-term volunteering is on the rise. Compulsory volunteering is also increasing, especially among youth. The amount of time offered by volunteers is shifting: committed core volunteers are putting in more hours, while episodic short-timers are putting in fewer hours. In other words, the robustness of volunteering is diminishing. The fact that religious giving is the dominant form of charitable giving in Canada, representing 50% of all giving, is no surprise. However, Dr. Reed found that religion was a core factor in the drive to contribute to the greater community as well. “People essentially learn how to be committed volunteers through their faith community,” he said. Along with religion, he found family and early life experience to be the main contributory factors to involvement in volunteerism. He posits that experiences in school may well set kids up to be long-term volunteers by inculcating a commitment to aid the community in which they live. Research on rates of giving and volunteering generally see Québec come dead last among Canadian provinces, with a 17% rate of involvement in volunteer organizations — half that in Saskatchewan. However, Dr. Reed found that the rates actually evened out when a form of volunteering referred to as direct personal assistance — regularly shovelling your elderly neighbour’s walkway or taking a casserole to the sick mother across the street or writing a cheque for a friend or family member — was included in the definition of volunteering. “For cultural and historical reasons, the volunteering impulse simply takes different styles and forms in contemporary Québec,” he told the conference. Dr. Reed’s research finds, however, that the civic core is shrinking across Canada, something that may have long-term negative consequences for both individuals and society. Dr. Reed describes the ingredients of social embeddedness as social connectivity, social anchoring and social continuity. Social connectivity entails relationships and interaction with people outside the immediate work/family nucleus and the establishment of long-term social networks with friends and peers, and is the first step to civic activism. Social anchoring consists of having a set of principles, ideals and beliefs that guide personal decision-making. Social continuity refers to such traits as living long-term in a given neighbourhood, or working in a same workplace for a large part of their life. The organization’s work to attract, allocate and manage volunteers and donors is largely oriented to supporting your operational purposes, but it is important not to lose sight of the other benefits that fostering such engagement can produce. As a leading health organization, the MUHC provides opportunities for volunteers and donors to achieve personal aspirations, to make a difference in the lives of others, to have a sense of contributing to the wellbeing of their community, and in this way you strengthen social embeddedness, vital for the social health of our society. Ms. Larocque has worked in the health sector for 22 years in a number of different settings: long-term care centres, hospitals, home care and, for the past nine years, at the MUHC, where she developed particular expertise in respiratory care. She has been President of the Nursing and Cardio-respiratory Professionals Union at the MUHC for the past five years. The union defends the interests of its members, while keeping quality of care front and centre in its efforts. Ms. Britton is a graduate nurse from the Royal Victoria Hospital (RVH). She is a pioneer in palliative care nursing, and worked for 38 years in hospital and home care. She presently works at the Griffith Edwards Addiction Unit of the MUHC, Montreal General Hospital, where she teaches yoga. She is President of the RVH Auxiliary and a member of the McGill Council of Palliative Care. Ms. Rowe joined the Sainte-Justine University Hospital Centre Foundation in 2012 as Executive Vice President, Development, responsible for leading the $200 million Healing More Better campaign. 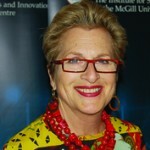 From June 2006 to October 2012, Ms. Rowe was the Executive Director, External Affairs at the Montreal Neurological Institute and Hospital (the Neuro) where she led the $40 million Thinking Ahead Campaign. Prior to assuming this position, Ms. Rowe was Director of Major Gifts at Centraide of Greater Montreal. Ms. Aziz gave birth to her son Alexander at just 28 weeks gestation in 2000. He spent four months at the Neonatal Intensive Care Unit (NICU) at the MUHC Royal Victoria Hospital and another month at the MUHC Montreal Children’s Hospital before finally coming home. For the past five years, Ms. Aziz has worked alongside fellow NICU graduate parent, Mr. Luciano D’Iorio, to organize the Tiny Survivors Cocktail that raises much-needed funds for the NICU. Mario Di Carlo has held management and senior management positions in international and crown corporations since the 1980s in roles focused on customer service and sales. For many years, he has put his personal and professional experience to work on the boards of various non-profit organizations dealing with issues related to health, poverty and education (Polio Quebec Association, Butterfly Wings Foundation, Association québécoise de la douleur chronique, West Island Mission, The Refuge and the Royal Astronomical Society of Canada). In 2007 he became involved at the McGill University Health Centre (MUHC) as a facilitator for the Chronic Disease Self-Management Program (CDSMP) from Stanford University, known as "My Tool Box" at the MUHC. This program has had a huge success among people living with chronic conditions in the Montreal region and Mr. Di Carlo has played a key role in spreading the program across Quebec. He is a certified Stanford University T-Trainer for CDSMP. His involvement at the MUHC continues to this day particularly with patients’ committees and patient engagement initiatives. He participated as a Patient Representative on the Transforming Care at the Bedside (TCAB) project and was a member of the Board of Directors of the MUHC. Mr. Di Carlo participated in editing the French version of Living a Healthy Life with Chronic Conditions (third, fourth and fifth edition), as well as in translating the Workbook and Leader Manual of the Chronic Pain Self-Management Program (CPSMP). Gwendolyn Andrews Nacos is currently president of Natural Furs International, one of Canada’s largest and oldest manufacturers of designer and high quality furs, and a philanthropic leader devoted primarily to assuring that Montrealer cancer patients and their families benefit from the clinical, psycho-social, practical and financial support they need. Ms. Nacos first started volunteering in oncology at the RVH, then became a member of the hospital’s Patients’ Committee and eventually its chair. Ms. Nacos moved on to serve as a member of the Board of Directors of the RVH and that of the Cedars Cancer Institute. In 1988, she founded Cedars CanSupport. Ms. Nacos served on the first integrated MUHC Board of Directors and on numerous committees before being elected into her current position. Ms. Barrer's career with CBC TV News spanned almost 30 years and three Canadian cities as well as international assignments. Among the numerous positions she held, the most enduring and fulfilling for her was Health Specialist Reporter. Today she works as a freelance writer and communications specialist. Mr. Copeman is currently on unpaid leave from Concordia, elected as Borough Mayor in Côte-des-Neiges–Notre-Dame-de-Grâce. He is also an Adjunct Professor in Concordia’s Department of Political Science where he teaches Québec Public Administration. He was first elected to the National Assembly of Québec in 1994 as the Member for Notre-Dame-de-Grâce, and was re-elected in 1998, 2003 and 2007. During his 14-year tenure in the National Assembly, he served in various capacities including as the Parliamentary Assistant to the Minister of Health and Social Services.